The Brewers manager Ron Roenicke named Yovani Gallardo, the opening day starter for the Brewers season opener April 6 at Miller Park against the defending World Series champion St. Louis Cardinals. 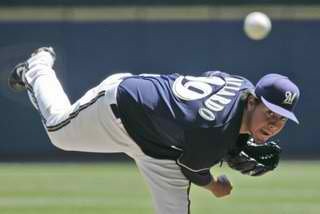 The 26-year-old right-hander will start his third consecutive opening Day game for the Brewers. Filling out the rest of the Brewers starting rotation, a mirror from last year are Zach Greinke and Randy Wolf, Shaun Marcum, and Chris Narveson. Zach Greinke pitched seven complete innings for the Brewers, giving up five hits, one earned run. I walk, and eight strikeouts, in a 7-1 win against the Arizona Diamondbacks. 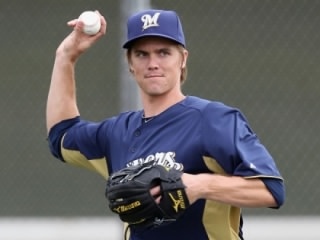 Greinke finished the game with an impressive ERA of 0.93 so far this spring, and was 16-6 for the Brewers last year, after missing the first month of the season with a cracked rib. Manager Ron Roenicke said, “Greinke would love to start opening day, but he’s a real good team player and understands the reasons for doing things. Here's the question, does it matter to you who the opening-day starter is? Jonathan Lucroy was 3-4 today, and a triple shy of hitting for the cycle raising his average to .513 this spring, and has had a hit in 13 of 15 games. Lucroy signed a five year extension earlier this week.The Brewers complete spring training stats. The Brewers announced outfielders Caleb Gindl and Logan Schafer optioned to AAA Nashville after the game today. Prediction time, I think the Brewers will win their division with a record of 95-67. Let’s hear your predictions for the Brewers season; will we have a 20 game winner or maybe two?